At first, it's not quite apparent why three Army brats with acoustic guitars would become a certified smash with their breezy, nonsensical hit "A Horse With No Name." You could not go three minutes without hearing that song on the radio with its "laa laa la-la-la-la" chorus and Neil Young-like singing. Looking back, I'm convinced that these guys were kind of a musical bridge between the tumultuous 60's and the post-war early 70's. These good looking hippies were deeply rooted in acoustic folk music, and not threatening or singing about war or pain, but represented a safe nomadic freedom. America didn't become a "pop group" in the formal sense until Warner Brothers paired them with Beatles producer George Martin three albums later. They were far more interesting when you could actually hear them playing their guitars. For all the grief the band took over the years from critics calling them wimps, there were far wussier acts (i.e. Air Supply, who I always thought epitomized the musical artist that truly needed to be shot and made to disappear immediately). Because of those acoustic leanings, America were the poster boys for 70's soft rock. In 9th grade, one of my friends used to make fun of their sometimes obtuse lyrics. Later on in my college junior year, there was a guy named Sal down the hall who absolutely worshiped them, and a sure fire way to get him ticked was getting him drunk and making fun of America (hard to believe). The debut album was a mixed affair. Besides the sand and congas "Horse With No Name" and the disaffected and sappy "I Need You," there were two cult FM radio hits -- the foreboding "Sandman" (with its hard A minor strums that everybody seems to recognize even now) and the brisk "Three Roses." If you say "well, what did America really bring that was unique to rock music" and even though they may not be hip enough to ever be elected to the Rock and Roll Hall of Fame, "Three Roses" showed what would happen if you miked acoustic guitars very close, made the EQ quite airy on the high end and played full, open ringing chords -- their trademark for years to come. When Fountains of Wayne's Adam Schlesinger was interviewed a couple of years ago about producing America's very recent Here and Now album (with former Smashing Pumpkins guitarist James Iha! ), he actually cited loving those very same musical techniques. So if a pop whiz like Schlesinger could endorse America, then their hipness badge was finally earned. It's now totally acceptable to like America, even as a guilty pleasure. "Three Roses" was just flat out ear-catching because of the aforementioned guitar style and an unusual set of chords concocted by America's Dewey Bunnell. You had a piercing A major 7th up the neck, an F#m 7th with an E bass, a very open E minor 9th then back to that F#m 7th, all accompanied by a lively conga player, then joined only by a warm and active electric bass. No drums. The strings were brushed across very fast so they almost sounded like a harpsichord to me. A light and pretty melody, slightly corny lyrics ("Three roses were bought/With you in mind") and uplifting harmonies. For me, this was a perfect song to play along to because it was all big acoustic guitar chords. I was not used to playing the instrument with such big open chords at such fast speed. I used my pick to make the treble notes ring, especially on the Emin9th-A7th chorus, then figured out the solo that ends the last minute or so of the song, right until it transitions to an Fmaj7th-G pattern at the end. 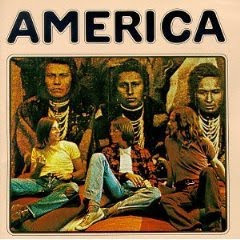 It was the song "Ventura Highway" from their 2nd album that turned me on to America in the 70s. They have remained one of my favorite artists to this day. From today's perspective, their first album showcased three young guitar players who all wanted to show off their best guitar "jams". These artistic contests completely disappeared by their 3rd album, but by then they had learned how to write thos pop hits that kept the bills paid.